A Very Merry Holiday Steampunk Blog Hop | Who Are You Calling Crafty? 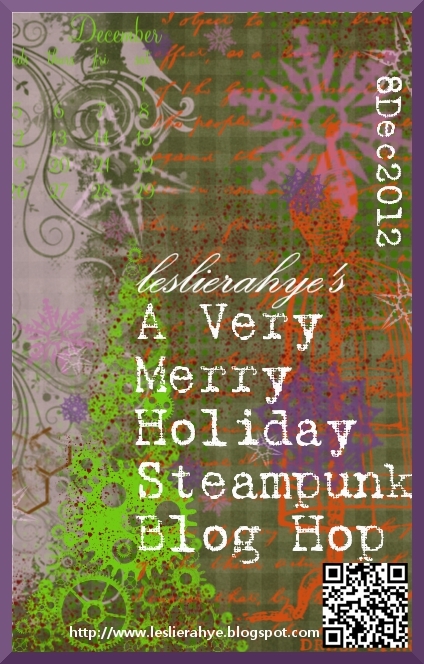 Happy Holidays everyone and welcome to my very first Steampunk Project EVER! Leslierahye has been trying to get me on the Steampunk Bandwagon for close to a year now, I honestly didn’t get it (I still only sort of get Steampunk but I am digging the gear thingies). I found some washers and gears in the garage which made me think hey let me try that whole Steampunk thing. My Tree was quite simple I used 9 washers and various gear thingies (I am sure that is the technical term) to form a tree. I laid it all out to see if it would work, instead of pulling out the glue and gluing piece by piece, I disassembled it. With the Metal Glue in my hand I had to quickly figure out what I was doing. Surprisingly it went well and I was able to get it back together and make it look like a tree. I took some thin copper wire and wrapped the tree (I thought it needed a little more intrest). I really liked how it looked but the Princess thought I needed some color, so I pulled out some metallic red Dew Drops. I really love how this piece turned out and not too shabby for my first Steampunk Piece if I do say so myself. Great job and nice digi paper! Wonderful ornament! I think your first step into steampunk is great! Love the digi papers as well! Thank you so very much! Nice job on your first steampunk project! I love your digital papers! Thanks for Sharing!!!! Nice! And I LOVE the papers! Thanks so much. Very cute…you really rocked those gears…Love the ornament! Fabulous! very cute and thanks for the papers. can they be used as blogger backgrounds? I am gonna find out. love this ornament – intricate and dashes of color. Thanks for the digi papers. Will be using this holiday for sure. Beautiful ornament! Thanks for the digi papers! lovely little ornament – and charming use of the materials! your digi-paper is just delightful, too! And very nice of you to make it available to all! Fabulous Steampunk tree ornament! Pretty cool for your first attempt at Steampunk! Thanks for the digi paper, it rocks. Your tree turned out fabulously! And thanks for the free digi paper. Your tree looks awesome! The princess was right on the money with the color idea and I love those metallic dew drops. Thank you for the papers, they are also lovely and steampunky. I love your steampunk ornament!